// Optional: configure GAI options. Nothing additional is able to be imported into the AppDelegate.swift(such as Google), just the standard UIKit. I have been through many tutorials and other SO questions, all to no avail. I figure that there is some small thing I am missing, but cannot find it. 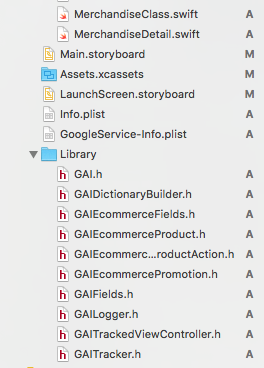 I have the .h files in my project, along with libGoogleAnalyticsServices.a, libsqlite3.0.tbd, libz.tbd, libsqlite3.tbd (all of which have been linked to library as well as CoreData and SystemConfiguration). I have created the -Bridging-Header.h and included these .h imports in it. The -Bridging-Header.h is linked in the Build Settings and I receive no errors with that. That is the main solution that I have found during my research, which hasn't helped me in this situation. I have tried to start over from scratch twice with CocoaPods and without (I made a copy of my project before starting) and I received the same error each time. Any help would certainly be appreciated. Thanks in advance. Well, it looks like I was able to get it squared away. There were several problems with all attempts on this. Cocoapods had not installed correctly. I reinstalled and then had better success importing the correct files. Doing it manually, as I posted above is not the best option. 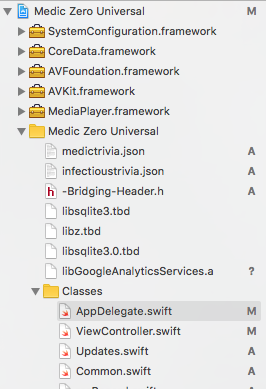 After the Cocoapods re-install and starting over from a fresh copy of my project, I was able to import Google into my AppDelegate.swift. 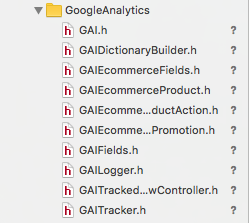 In your -Bridging-Header.h, do not #import <Google/Analytics.h>, instead import the files individually. Here is an image of the files available to be imported. Do not trust Google tutorials to provide the most effective instruction and utilize the many SO posts on the topic. I really hope this helps someone not spend 10 hours on the problem as I have. Swift 4.0 and xcode 9.0.1 finally I resolved. // Optional: automatically report uncaught exceptions. // Remove before app release. My error was use of unresolved identifier when i was using the singleton GAI.sharedInstance(). // Configure tracker from GoogleService-Info.plist. If there are errors, deleting DerivedData and cleaning the project can help. The only way to make it work for me was downgrade Google Analytics pod version to 2.0.4. Not the answer you're looking for? Browse other questions tagged xcode swift google-analytics swift2 or ask your own question.